Gib hier den Namen für die Beschriftung ein. Außerdem die Nummer des gewünschten Ordner-Designs. Evtl. noch Kinderkrippenzeit, sollte die Beschriftung nicht Kindergartenzeit sein. 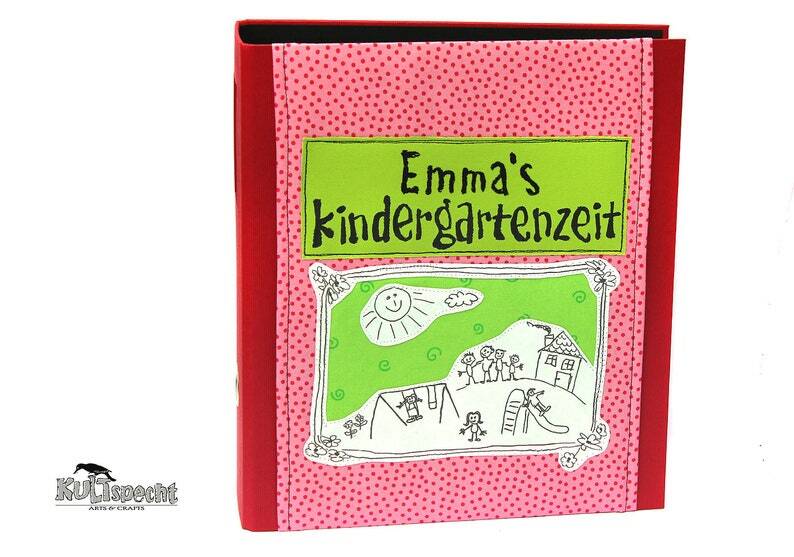 A red design folder for the most beautiful photos and drawings from his childhood. A cardboard folder in five different fabric designs of your choice. With the addition of the individual name, printed in Handmade style. Default Folder for A4, size approx 29x32x8cm. The handmade cloth bag is pulled over and thus the drawing is protected got them a dirt-repellent surface coating. This means you can the fabric quiet sometimes wash without anything happening. The shell is made of cotton fabrics and lined with soft volume fleece. Tells me in the comments field Your caption wishes and the number of the designs. In an inscription in englicher language the font is a little bit smaller, because the term "nursery school time" has more characters than the term "kindergartenzeit".